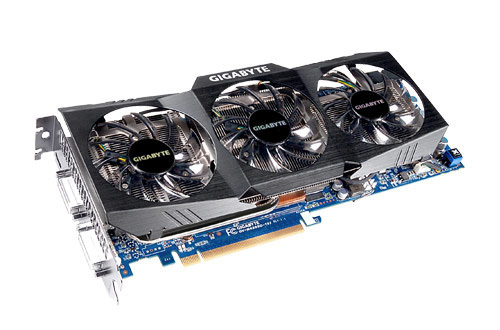 Gigabyte today intros another member from its Super Overclock Series – the GTX 480 SOC (GV-N480SO-15I), which comes with custom WindForce 3X cooling solution. Designed specifically for overclocking , the Directx 11 GTX 480 SOC has a GPU clock of 820 MHz, a shader frequency of 1640 MHz and 1536 MB GDDR5@ 3800 MHz with 384-bit memory interface. 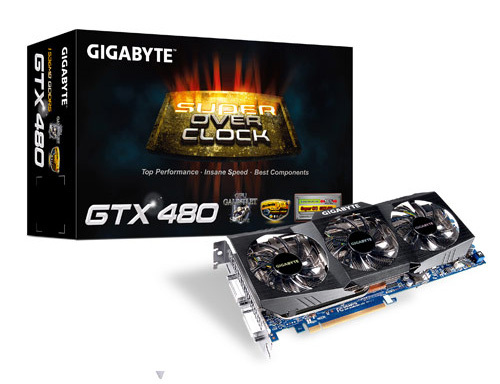 It features Gigabytes’ Extreme Dual BIOS technology, which contains two different BIOS chips designed for separate purposes and supports one-touch dual BIOS switching button to shift between two BIOSes, SOC Default BIOS and LN2 BIOS. The video cards is equipped with WINDFORCE 3X cooling solution witch packs three copper heat pipes and three “ultra quiet” PWM fans with special 3D anti-turbulence inclined-fin, which effectively minimizes the flow of turbulence between three fans. The GTX 480 SOC also feature 14 phase PWM design, GPU Gauntlet Sorting, OC Guru graphic card smart tuner and voltage read point.